Johanna, known as Annie, was born in Scotland in the village of Partee on the Isle of Skye in 1871. Her family appears to have been frequently on the move with her parents born in Enzie, her brother William born in Inverness and the family immigrating to Toronto, Canada in 1872 (immediately after the birth of her brother Alexander). Although she was the fourth child born in the family, Johanna may have been the first of her remarkable siblings to have entered religious life. 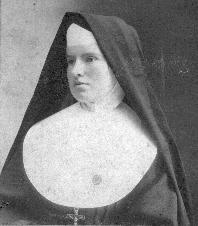 She entered the Community of the Sisters of St. Joseph, in Toronto, at 20 years of age. Most of her religious life was spent teaching in the Separate school system in various locations around the Province of Ontario. 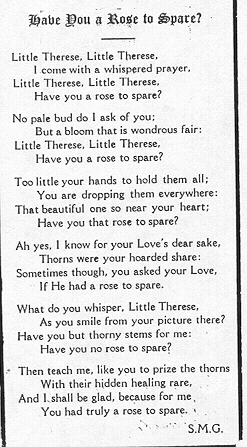 In this apostalate her dramatic and musical talents blossomed and she produced songs, plays, poems and operettas for the pupils. Most of these plays were of a religious nature and brought her to the attention of the wider religious community. Larger productions for the whole community followed: "The Poserello" on the life of St. Francis of Assissi (coincidentally the name of her parent's church where her brother William was associate pastor), "Christ the King", "A Salute to Canada 1867-1927" performed at Toronto's presdigious Massey Hall, and "The Lone Company" about the Jesuit Martyrs commissioned by Archbishop Neil McNeil. These larger productions were produced in theatres where she worked in conjunction with the Christian Brothers who also taught in the Separate Schools. 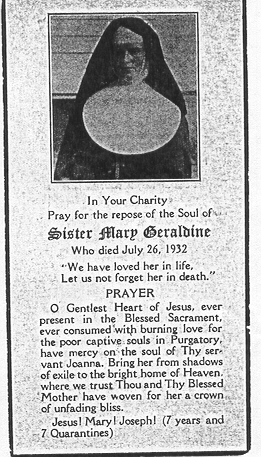 She died at a relatively young age for this family, at 61, on July 26, 1932, her obituary making front page news in the Toronto Telegram.